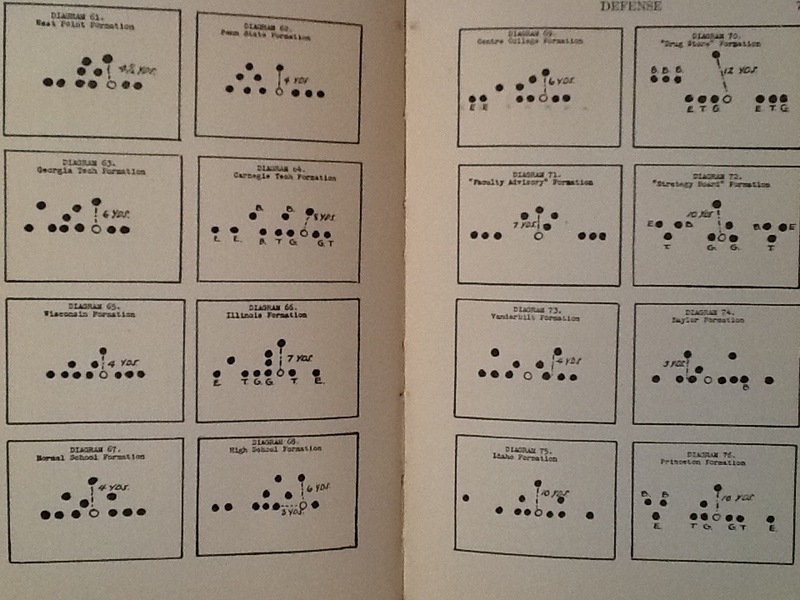 I love paging through old coaching books and seeing how far this game has evolved. Many times I discover ideas that we think of as new and revolutionary were being done in a similar form decades ago. It’s interesting that in many of the formations there isn’t a player directly behind the center and the ball could be snapped left or right. Whatever happened to the A11 anyway? Many of the concepts in the A11 which made a splash and was dubbed “revolutionary” had roots in the offenses from decades ago including what Glenn “Tiger” Ellison dubbed the “Lonesome Polecat” in Middletown, Ohio in the early 1960’s. That evolved into the “Run and Shoot” which was truly revolutionary in many ways. As Chris Brown points out in his book, The Essential Smart Football at that time football had taken on many of the virtues of the military and the game was very structured and rigorous. Ellison points out in his book that kids don’t learn to play that way on the play ground. The game was much more fluid with kids simply running and getting open with no predetermined routes. 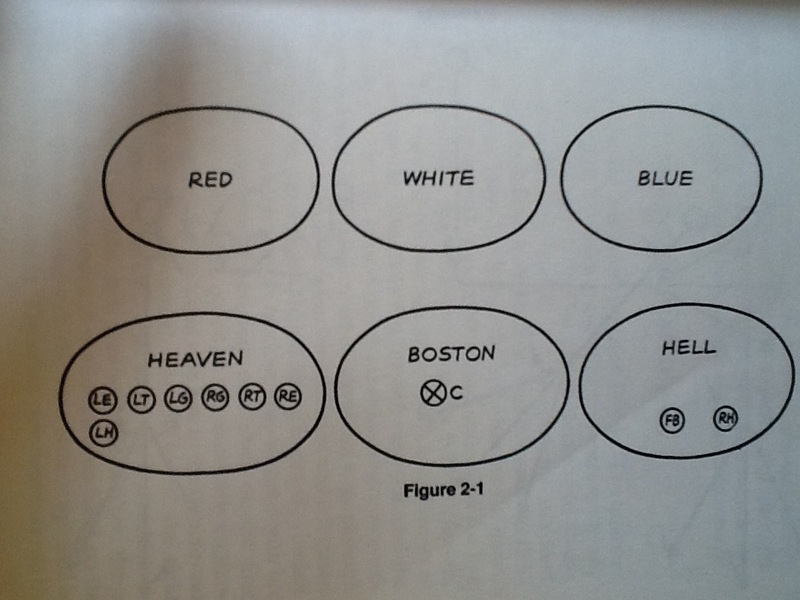 In order to save a season, Ellison incorporated the Lonesome Polecat formation that was structured with areas like Heaven, Hell, and Boston and deep areas Red, White, and Blue. It’s not quite how Dub Maddox would map the field. Ellison diagrammed the base play, called “Dead Polecat,” as shown below. From that offense Ellison developed the tenants of the Run and Shoot which Brown astutely points out have been “merely co-opted into other attacks.” The effects of what Ellison developed in the 60’s can be seen in many of today’s modern offenses. The words of Woody Hayes on the dust jacket of Ellison’s book, “I am sure that every coach, regardless of the level in which he works, will profit from the study of revolutionary ideas expressed in this book” certainly ring true. On a personal note, we used the Lonesome Polecat in 2002 as part of a strategy to compete with a two platoon, no-huddle team that was one of the first in our area running the spread offense. We were at the smallest high school in our conference and all of our linemen were two way starters. We knew trying to take these guys on conventionally would run us out of gas by the third quarter. What we decided to do was take our lineman off the field replacing them with freshmen and sophomore linemen and aligning in the Polecat. We would do this every six minutes of the game. We took our best 5 skill players and played against their best five since they covered down to the group of players standing out on the numbers. 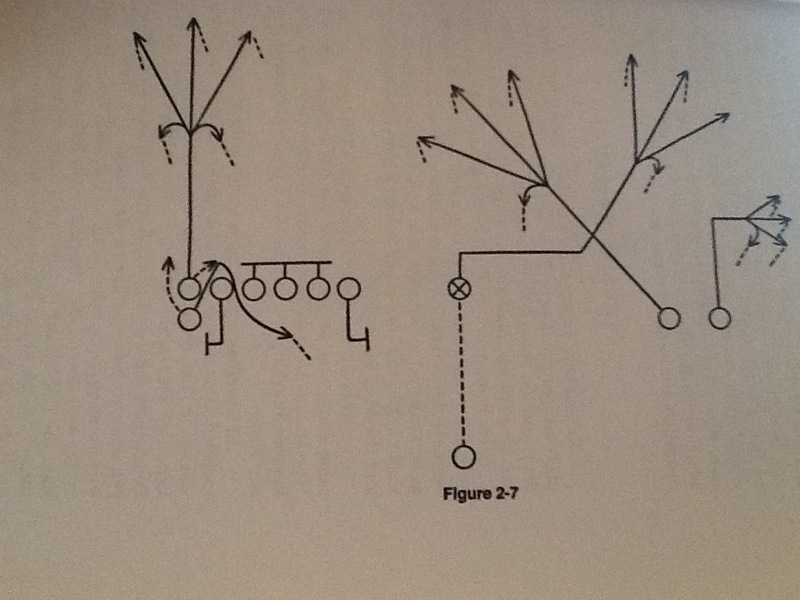 We used parts of our offense like stick and jet sweep. We moved the ball and used clock, and more importantly rested our linemen. We missed on a chance to go ahead late and eventually lost in double overtime. However, Polecat gave us the opportunity. As I like to point out in clinic talks, this game constantly evolves and adapts ideas and principles that were used before. Old ideas come back in a changed form. Today’s most effective offenses are not necessarily doing anything different schematically than what other teams do. Aside from talent though, the best teams create a system where everything is tightly integrated and taught in a detailed manner. 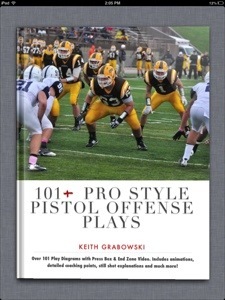 This entry was posted in iPad, Offense, technology by coachgrabowski. Bookmark the permalink.